Kittens learn to lick themselves by two weeks old and adult cats spend up to 50 percent of their awake time grooming themselves. So why should you still give your cat a bath? A bath stimulates the skin and removes excess oil, dander, and shed hair. It also offers an opportunity to teach your cat that being handled even in unexpected ways won't hurt them. Cats will need to be touched by the vet, handled by vet techs, or cared for by house sitters and guests. Making the bath a pleasant experience helps cats "generalize" the event to future similar situations. A good guideline is to bathe shorthairs no more than every six weeks; two to three times a year during shedding season should suffice. Bathing too often can dry the skin. 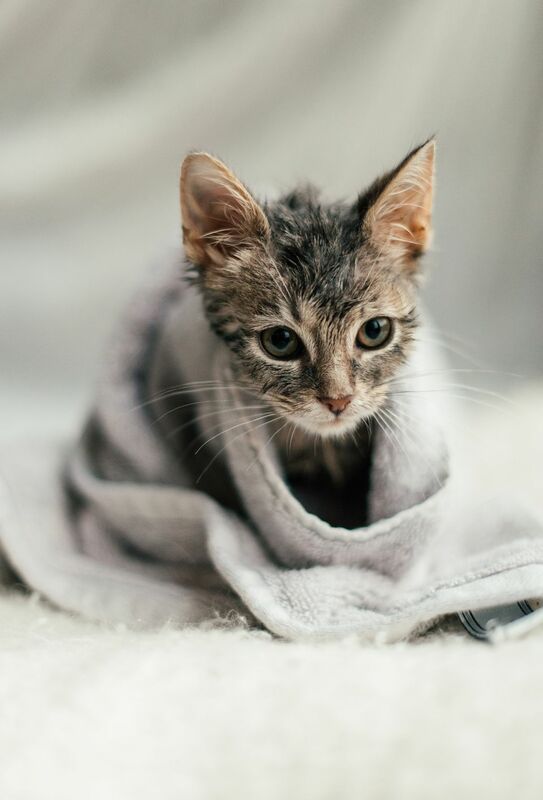 Kittens accept baths most readily so start as soon as you adopt one, as long as it's at least 4 weeks old. Elderly cats or extremely ill cats may be stressed by bathing so follow your veterinarian's recommendation in these instances. Human baby shampoo or dog products can be too harsh and dry the cat's skin, and in some case may be toxic. Before getting your cat wet, brush its fur thoroughly. As for you, wear old clothes and expect to get wet. The bath area should be warm and draft free. The bathtub will do, but you may be more comfortable if you can bathe your cat in a waist-high sink. Move all breakables out of reach and push drapes or shower curtains out of the way. Avoid anything (strong scents, scary objects, mirrors) that potentially frighten cats, so the bath is as pleasant as possible. Assemble your shampoo, several towels, and a washcloth near the sink or tub, and run warm water before you bring in the cat. The cat bath temperature should be around body temperature and pretty warm. Place a towel or rubber mat in the bottom of the tub or sink. Cats hate the insecure footing of slippery surfaces and this will make it less stressful. Or, try standing the cat on a plastic milk crate so your cat can grip it with its paws. This also allows you to wash the cat from both above and below without turning the cat over. Close the door to the bathing area, or you risk having a soapy cat escape. For small cats or kittens, use the double sink in the kitchen, two or more large roasting pans, or a couple of buckets or wastebaskets set in the bathtub. Fill each with warm water, then gently lower your cat (one hand supporting its bottom, the other beneath the chest) into the first container to get it wet. Most cats accept this method more readily than being sprayed. Let your kitty stand on its hind legs and clutch the edge of the container as you thoroughly wet the fur. Then lift the cat out onto one of your towels, and apply the shampoo, using the washcloth to clean its face. After lathering, dip the cat back into the first container to rinse. Get as much soap off as possible before removing and sluice off excess water before rinsing in subsequent containers of clean water. Jumbo-size adult cats can be hard to dunk, and running water can be scary for them. Instead, you can use a ladle to dip water. If you have a spray nozzle on the sink, use a low force, with the nozzle close to the fur so kitty doesn't see the spray. Never spray in the face; use a wash rag to wet, soap and rinse that area. Keep one hand on the cat at all times to prevent escapes. Rinse beginning at the neck and down the cat's back; don't neglect beneath the tail or on the tummy. Wrap the clean cat in a dry towel. Shorthaired cats dry quickly, but longhaired felines may need two or more towels to blot away most of the water. If your cat tolerates or enjoys the blow dryer, use only the lowest setting to avoid burns. Some cats will truly enjoy the bath and others will not. Remain patient and don't scold your cat during the bath. If your cat is really hating the bath, try plenty of praise, solicit some help, or rinse off the soap and try again next time. If bathing your cat at home seems too problematic, a professional groomer that is experienced with cats is your best bet for an effective cleaning by a professional. Clip your cat's claws a day beforehand to prevent scratches. Don't do it immediately before or the cat will associate clipping with bathing. Try floating a ping pong ball or another fascinating cat toy in the water to entice the cat to try to fish it out. A cat who plays with the water will be less likely to fear it. Don't dunk your cat’s face or splash water on it; that's what gets cats upset. Professional groomers often use a figure-eight cat harness to tether the cat in place, which leaves your hands free to clean the cat.